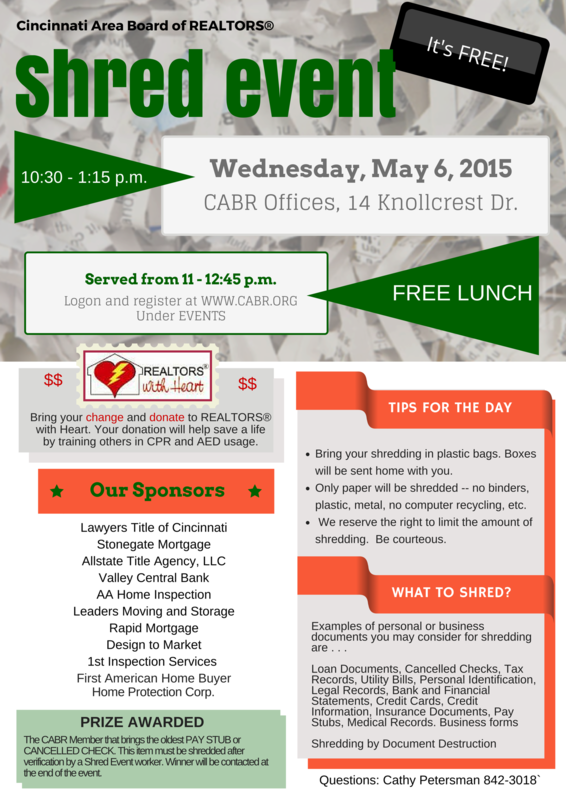 Help protect yourself from identity theft – Plan now to attend the CABR Shred Day on Wednesday, May 6. This event will be FREE for CABR members and includes FREE LUNCH. Lunch reservations are needed. Logon and register at www.cabr.org under events. Examples of personal or business documents you may consider for shredding are: Loan Documents, Cancelled Checks, Tax Records, Utility Bills, Personal Identification, Legal Records, Bank and Financial Statements, Credit Cards, Credit Information, Insurance Documents, Pay Stubs, Medical Records and Business forms.